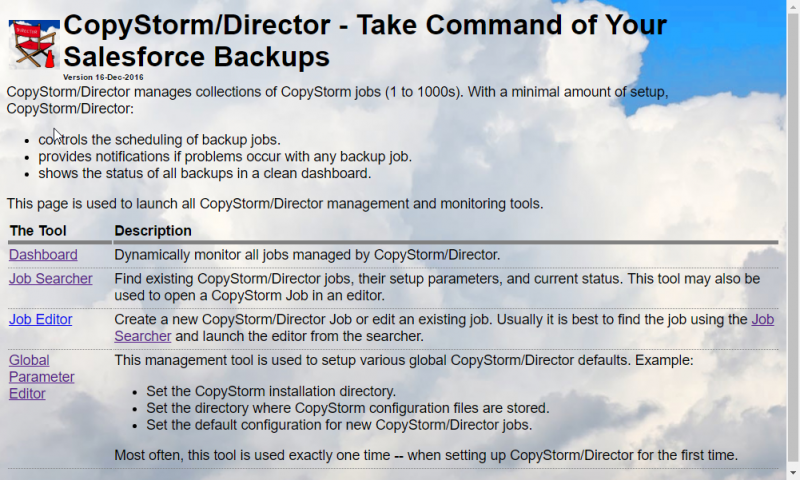 The CopyStorm/Director GUI is distributed in two formats — a stand-alone Java application and a web browser application. In most situations either (or both) applications can be used to edit or view the CopyStorm/Director database and the choice of which to use is up to your organization. The stand-alone Java application has a few more capabilities than the web browser application, most of which are related to its ability to stop and start local processes. The primary advantage of the web application is that it can run anywhere on your network. In addition it has a dynamic dashboard suitable for near real-time monitoring of CopyStorm backups. Setting up the web browser application is slightly more complex than the “unzip and go” approach of the Java application. Step 1: Define a CopyStorm/Director Data Source. The CopyStorm/Director web application uses a datasource with the resource name “jdbc/CopyStormDirector”. Step 2: Deploy the CopyStormDirector.war File. There are several ways to deploy the war file. Your Apache/Tomcat administrator will know how to deploy it using your organizations standards. Step 3: Test the Installation. Step 4: Review the CopyStorm/Director Web Application Documentation.